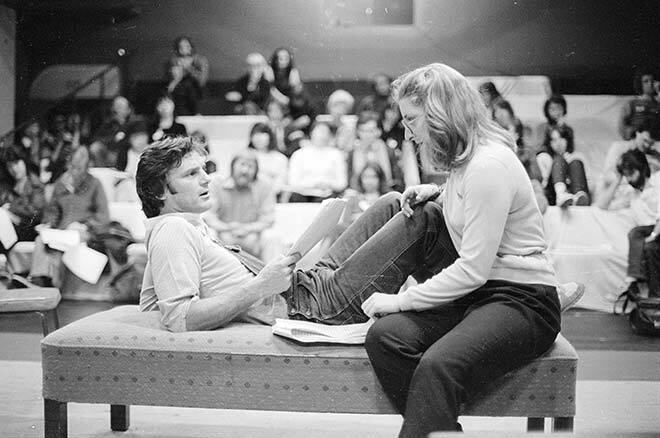 Drama students Jeffrey Thomas and Judy Gibson workshop the script for A street called straight, by Seamus Quinn, at the 1982 New Zealand Playwrights Workshop. Workshopping means reading through a draft script, then discussing how it could be improved for performance. A street called straight was produced two years later by Wellington's Taki Rua theatre. It was written by a recent immigrant from Ireland, and the company debated fiercely over whether this contravened its 'New Zealand-only' policy. However, the production was critically acclaimed.